TWSE (-20.6%), SHCOMP (-20.3%) and HSI (-19.8%) whilst the only two gainers were JCI (+3.2%) and KLCI (+0.8%). Last Friday, Bursa Malaysia ended 2011 on a high note as the KLCI surged 24 points to 1530.7 points on last minute window dressing in heavyweights. In the wake of a strong breakout above the 200-d SMA (now at 1501), the KLCI is poised to trend to higher highs in its bid to rechallenge its all-time historical high of 1,597 over the intermediate-term. 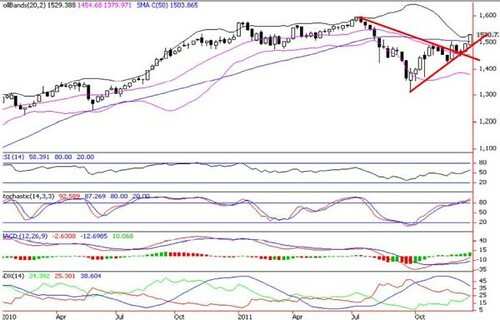 Nevertheless, we expect KLCI to remain volatile this week amid profit-taking pullback following last week’s fund managers' ritual of window dressing coupled with grossly overbought technical readings. Immediate support is 1500 whilst further upside targets are 1550-1570. 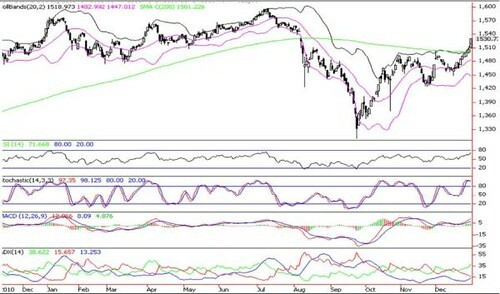 While big caps are poised to consolidate further this week after recent solid gains, we expect rotational 2nd and lower liners to shine to provide the sustainable momentum to our market in anticipation of a Jan and Chinese New Year rally.